According to Harvard Health Publishing, Bicycling will keep your heart healthy and muscle strong and also help you lose your extra body weight. Bicycling keeps easy your joints. “When you sit on a bike, you put your weight on a pair of bones in the pelvis called the ischial tuberosities, unlike walking, when you put your weight on your legs. That makes it good for anyone with joint pain or age-related stiffness,” says Dr. Clare Safran-Norton, a physical therapist at Harvard-affiliated Brigham and Women’s Hospital. Again Dr. Clare Safran-Norton says “The benefits carry over to balance, walking, standing, endurance, and stair climbing,” (source www.sidewalksforsafety.org). According to the Telegraph, a study said that those who exercised in their leisure time lost 9.9lbs (4.5kg) while those who cycled lost 9.2lbs (4.2kg). In that study, the participants were aged between 20-45 years old and had BIM of 25-35 kg/m2, which make the officially overweight. They were divided into 4 groups. One group will do cycling every day around eight miles. Another two groups will do the physical exercise 5 times in a week for 35 to 55 minutes. No physical activities will be done by the last group. After 6 months all the groups except the last one had lost 5.7lbs (2.5kg). 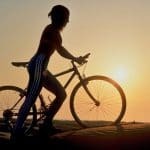 “Riding the bike to and from work is at least as effective a means for reducing fat mass as exercising during your leisure time,” said the doctoral student from the Department of Biomedical Sciences of the University of Copenhagen Jonas Salling Quist (source medicalxpress.com). This research proved that people who can not make proper time for physical exercise because of their business they can use a bike to commute their working place, which can help them to lose their extra weight.